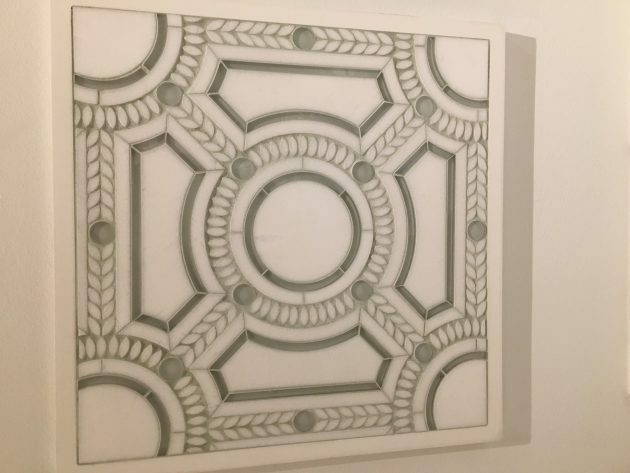 Attending a presentation in Chicago last week of New Ravenna tile and stone, inspired me to devote this month’s blog post to stunning new designs in tile that are so creative and artistic, I just had to share a few with you! They reflect new trends in tile and design which I will explain here. I cannot wait to use them in my next design project! Mosaic tile does not have to be just stone or ceramic porcelain but can incorporate other materials such as glass and metals. 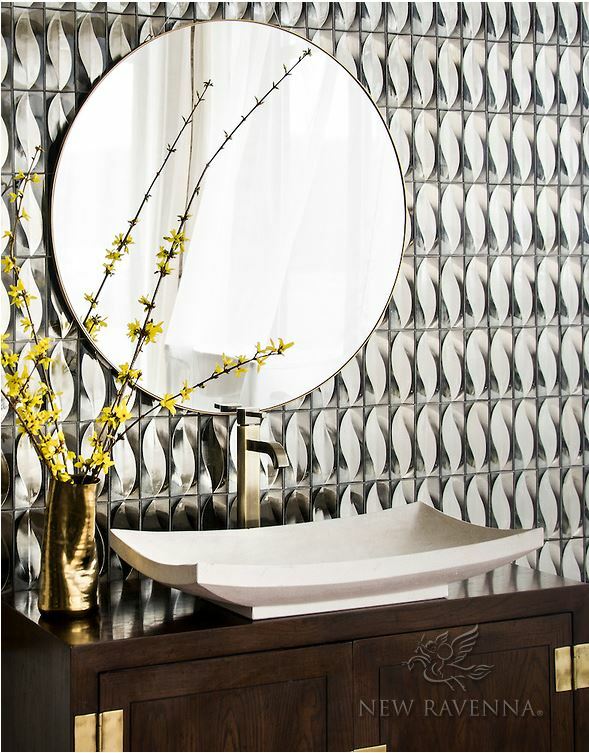 This trend, which incidentally is not confined to tile, is here to stay. 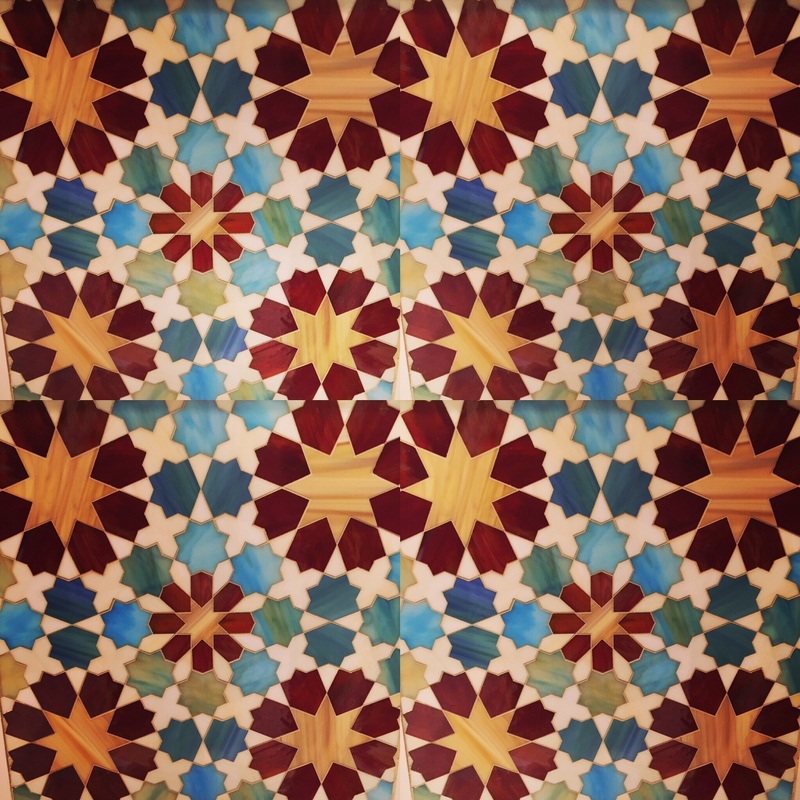 You may think that to add variety to a tile design, you should look for a tile with different colors. However, using different shades of the same color by mixing materials and textures into different shapes will give you a more subtle, tone on tone look, which is very soothing to the eye. Perfect for your bathroom. I am not talking about rustic stone or ledgestone here which has been around a while. I am referring to contemporary styled porcelain tile with a three dimensional surface design, which is actually quite inexpensive. 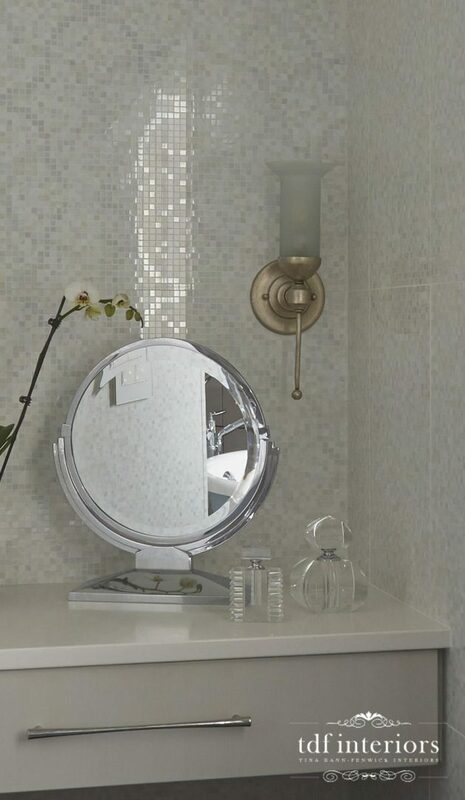 I love this new look which gives amazing depth to a backsplash or the wall behind your vanity mirror. 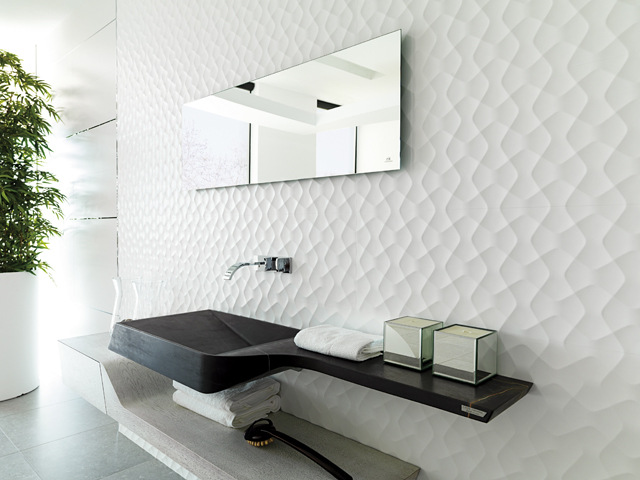 The soft three dimensionality of this tile catches the light and plays with shadows to give you an amazingly original look. New Trends: Tile which looks 3D but isn’t. 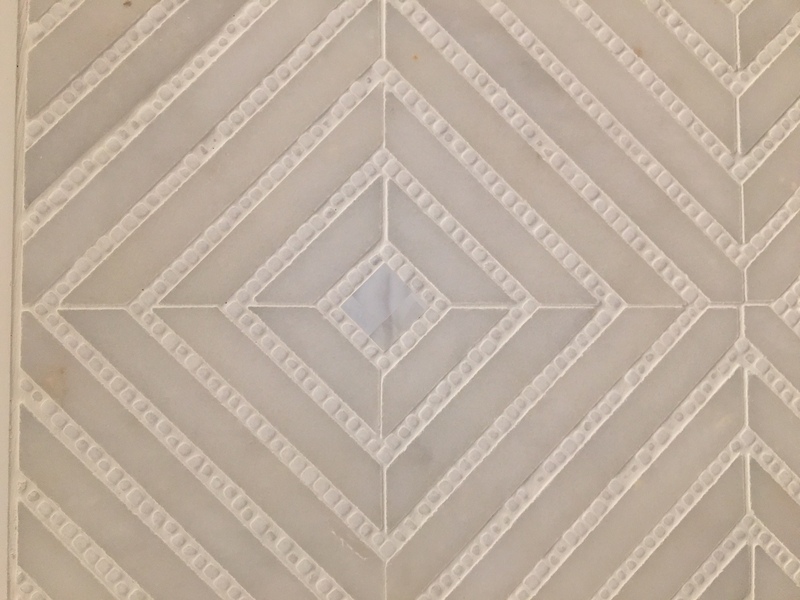 Often geometric, this could be considered trompe l’oeil, which you may think is a concept associated with French 18th and 19th century design. However this looks very edgy and up to the minute with these reinterpretations. I have seen this trend in wallpaper too. There is a practical advantage to this tile over the real three dimensional tile shown above. There is no difficulty with fitting faucets and glass shower panels flush to the tile. Not everyone wants just neutral colors in their bathroom. Instead of just adding color with towels or paint, add some color and character with your tile! Beautiful soft aqua blues and turquoise in the bathroom remind us of the sea and sky. 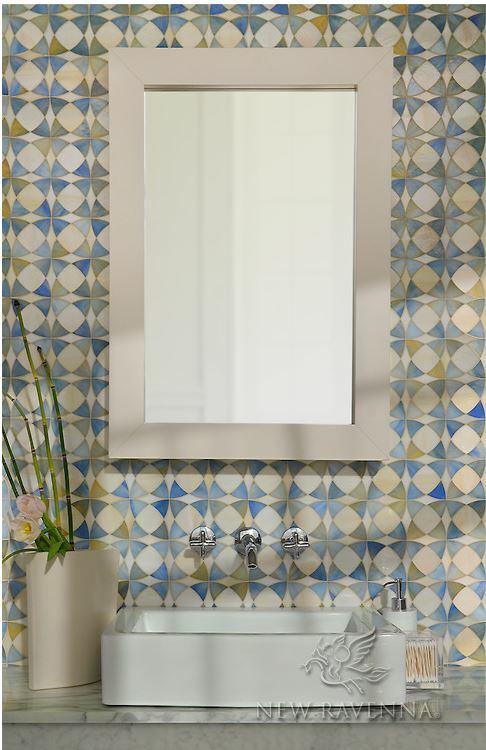 Be bold with color and design but in small doses, such as a back splash or as a striking back drop to your vanity mirror. You can be more creative in your powder room, where you could experiment with jewel tones to give your guests the ultimate in eye candy. With a small space you can achieve maximum effect without such a major investment.